All too often it is the practitioner who gets all the information about the patient, and the patient gets little information about the practitioner and their practice. I would like to begin with you by changing that. My full name is Erika Beth Eckman, and I went to Chiropractic school at Logan College of Chiropractic in St. Louis, MO. I have a wonderful, supportive family all over the country, and close friends here in San Diego. When I am not sharing my passion for healing in the office, I love to go to farmers markets to support and enjoy the good fruits of local and organic farming. These growers are my heroes and have my ultimate respect. I am also passionate about staying active and meeting new people by spending time out on the water in the California sunshine. Surfing, sailing, and sports nearby on the sand volleyball courts. I hope you enjoy San Diego as much as I do. I was originally inspired to be a healing practitioner because I saw people close to me who were not able to enjoy life at its fullest because of chronic pain and illnesses that I later learned could be prevented with eating foods as nature intended and living a life of balance. I have chosen to devote my life to the healing arts because I believe that healing is a natural process present inside of all of us. We have the ability to heal ourselves. The structures of life begin to lead us away from this at a very early age. I have a memory of being six years old and laying my hands on my dad’s head with the intention of taking away his headache. After all my education, this memory is an even greater treasure to me. I am grateful I have dedicated my life to this work because in my journey to discover how to help others I have become healthier, more balanced and more disciplined at staying healthy in this chaotic and health challenged environment. I am also fed through seeing the positive changes in my patients. Helping people improve their quality of life is the most rewarding way to spend a “9-5.” I cannot imagine a better way to spend my time. I believe with all my heart in the principles of the original healing arts, which are: 1. First, identify and treat the cause of your dysfunction with the goal of restoring normal function. 2. Work with your self-healing, self-regulating processes and identify what is limiting it. 3. Teach you how to care for your own body through diet, exercise, daily care, and a balanced lifestyle. I believe with all my heart in how I practice and always strive to improve it. I believe I give an excellent service for a fair fee. I want to help people. I want you to refer and continue to refer patients to me because the people around you affect your health. 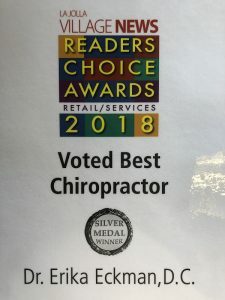 What makes my practice unique is my passion to restore the natural process of healing in my patients through a combination of therapies designed to treat the whole person, not the symptoms or parts of a person. I established my practice in San Diego because it has become a home to me, a place where I am thriving, enjoying life, and a place where I want to give the passion for my life’s purpose away. My promise to you is a laser-like focus on helping you reach your health goals by following the principles of the original healing arts, a commitment to keeping you on track when life gets in the way, and compassion for getting you better every time you visit for care. Yours in health, Dr. Erika Eckman, D.C. I went to Chiropractic school at Logan College of Chiropractic in St. Louis, MO. I have a wonderful, supportive family all over the country, and close friends here in San Diego.